Keep an eye out for the "Salmon Cycle" in 2020. 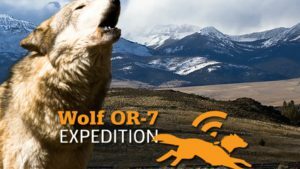 Wolf OR-7 Expedition: 1,200 miles retracing the remarkable journey of an ordinary wolf. In September 2011, a young wolf left his pack in NE Oregon and within a few months made a zig zag journey of over 3,000 miles into California. He became the first and only free roaming wolf known in the state of California in nearly 90 years. The last wild wolf in California was killed in 1924. Earlier in the spring of 2011, Oregon Dept. of Fish & Wildlife had fitted a collar around his neck that signaled his whereabouts in order to better understand wolves and their movements. 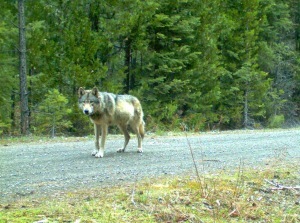 At the time, this 2 and a 1/2 year old male was the 7th wolf to be collared in Oregon. He became known as Wolf OR-7. Along his journey of dispersal, Wolf OR-7 crossed shrub steppe deserts, tall mountains, wilderness areas and busy roads. In spring 2014, as the founder of the Wolf OR-7 Expedition, I retraced a beeline of his route for about 1,200 miles by bicycle and on foot along with a small Wild Peace Alliance team. Wolf OR-7’s journey is not unusual for wolves, but he encountered a landscape very different from the one his ancestors found a century ago. With the return of wolves to places they haven’t been in decades, we have a chance to begin a new story. A story not based on old European tales, opinions and hearsay but the story of an actual wolf. A story with the potential to turn into a balanced coexistence with these keystone carnivores. See the story of a documentary expedition retracing the path of Wolf OR-7 to explore coexistence with wolves. Funded by Sculpt the Future Foundation, Xplore and Kickstarter supporters.